Description: The Cairngorms Nature BIG Weekend 12-14 May is a celebration of the fantastic natural heritage of the Cairngorms National Park. With over 50 activities taking place across the Cairngorms National Park there will be something for everyone, from families to the more seasoned nature lover. TV naturalist Nick Baker is the special guest again in 2017 and you can join him on a ‘Minibeast safari’ or hear him talk about his life as a wildlife presenter in Blair Atholl. There are 4 main hubs being used across the Park (Badenoch & Strathspey, Blair Atholl, Glen Tanar & Upper Deeside, Tomintoul). You can search via the interactive map or the list of events by time and day. Description: Our new Belwade Farm visitor experiences give our visitors the opportunity to tour the farm with our tour guide who provides you with information on the charity, Belwade Farm and tell you more about the individual cases our grooms are currently working with. After the tour we have 4 mini workshops which are designed to be both educational and interactive and suitable for all age groups and abilities. Come along and spend the day with us here at Belwade Farm you can take part in the activities which interest you throughout the day. As well as the activities we have lovely farm trails where you can see the horses in the fields while enjoying the stunning Deeside scenery. Our Fairy woodland is now open for the Summer so if you have time you can even do a bit of Fairy spotting. Our Bistro is open 11am till 4pm with lunches served between 11.30am and 2.30pm. If you require any further information on a visit to Belwade Farm please call 013398 85398. Please book your space by calling number above or by completing the online interest form. Description: A fantastic free family day out in Fraserburgh town centre featuring well-known children’s entertainer Artie from the Singing Kettle who will be performing his new solo show Artie’s Tartan Tales. Super Saturdays will also feature a wealth of stall holders from near and far, local entertainers,live bands, hot and cold food, children’s activities plus much more. 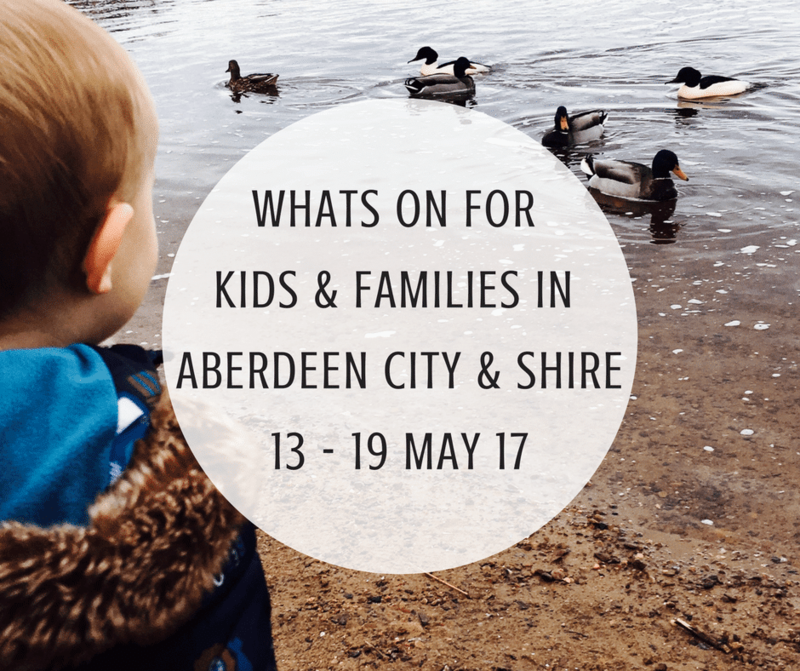 Greyhope Bay – Family Fun Day in the Marquee! Description: FIND OUT ALL ABOUT GREYHOPE BAY at our exciting community event and family fun day on Saturday May 13th! You are invited to a free event hosted on site (Greyhope Bay – around the corner from Torry Battery) in a stunning glass fronted marquee with spectacular panoramic views of Aberdeen! 3D Virtual Reality Tour of our proposed building design for a new iconic build visitor and marine education centre for Aberdeen! Life sized inflatable minke whale! Touch tank with crabs, star fish and other marine life! Stalls with interactive marine science exhibits! Food Vans & Ice Cream will be available on site. Stall holders to be announced later this week. This event was made possible by the Torry Community who voted for Greyhope Bay through the UDecide Torry Participatory Budget. A BIG THANK YOU! All Equipment and Barriers provided. Coach Led, Fun, Organised Activity. Music and interactive play help to create a fun and exciting experience!!! Description: Let the kids enjoy a fun afternoon of Inflatables, music, soft play, face painting and fun whilst you relax with a coffee and fine piece at the wonderful Macbi Community hub at Newlands Road, Mintlaw. Macbi Hub boasts of a wonderful soft play for the little ones with adjoining fully enclosed outdoor play area, as well as a fully refurbished cafe serving hot & cold drinks, hot food, cakes and pieces and Rizza’s lovely ice cream. Its only £7 for use of Macbi’s soft play areas & access to the Wide range of Inflatables. Or for use of just the Inflatables it’s £5. Pay at the reception on arrival where you will be issued with a wristband. Description: Celebrate the Cairngorms Nature BIG Weekend and explore around the wonderful Invercauld Estate with Mandy Tulloch of Mud Pies. Collect sticks and other woodland items and learn how to light a small fire without matches. It’s not the easiest thing to do but a great skill to learn and a fab party piece! Toasted marshmallows for everyone who manages! It’s FREE! Booking essential – https://www.eventbrite.co.uk/e/camp-fire-capers-tickets-33215287820. Please note – alternative woodland activities suitable for younger children may be provided if there is a “no fires” policy in place due to low rainfall. Description: Thistle Youth under 13’s are hosting a May Fair at Sheddocksley Community centre to raise money for their upcoming tournament in Ireland, please come along and support. Loads of different stall holders will be there including, sweets, cakes, handmades soaps, glasswear to name but a few. Entry costs £2 for adults and £1 for children, this includes a refreshment. Hope to see you there!!! Description: Our weekly class starting at our new venue MACBI Community Hub in Mintlaw. Join us for 6 weeks to have fun with shapes 5 months to approx 18 months. Description: Join us for 6 weeks of fun with shapes – approx 18 months to 5 years. Get creative with your little ones, our classes are curriculum based aswell as fun and making some creative makes and memories. Description: DANCE YOUR HEART OUT at our Wynford Disco! £10/Child including a HOT BUFFET MEAL and a LASER LIGHT DISCO! Children 1-year-old and Under are just £5! Get lost in the moment (and the fog machine!) with our DANCE COMPETITION and join the FUN! Description: Showing on our large screen the Oscar winning La La land.